On January 22, 2019, the Getty Conservation Institute (GCI) announced the completion of almost a decade of research, restoration / conservation efforts, and infrastructure improvements at the Tomb of Tutankhamen in Egypt, one of the best-known cultural heritage sites in the world. The project was a multi-year collaboration between the GCI and Egypt’s Ministry of Antiquities. It focused on restoration, conservation and the creation of a sustainable plan for continued management of the tomb. Photo (by Carleton Immersive Media Studio; Carleton University/J. Paul Getty Trust) shows the north wall of the burial chamber depicting 3 scenes. On right, Ay, Tutankhamen’s successor, performs the “opening of the mouth” ceremony on Tutankhamen, who is depicted as Osiris, lord of the underworld. In middle, Tutankhamen, dressed in the costume of the living king, is welcomed into the realm of the gods by the goddess Nut. 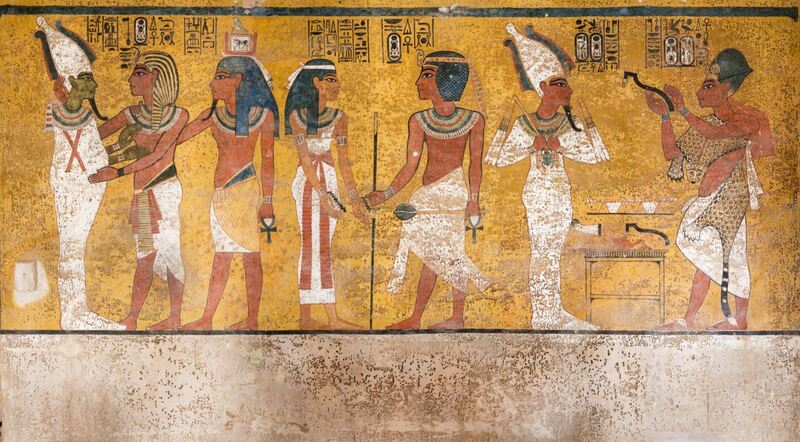 On left, Tutankhamen, followed by his ka (spirit twin), is embraced by Osiris. On January 31, 2019 a GCI symposium took place, in which the collaborative Tutankhamen project was presented, together with colleagues from the Egyptian Ministry of Antiquities. “Conservation and preservation is important for the future and for this heritage and this great civilization to live forever,” said Zahi Hawass, Egyptologist and former minister of State for Antiquities in Egypt, who also initiated the project with the GCI. 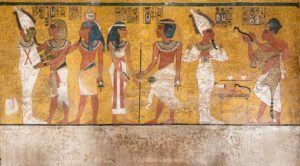 When the tomb was discovered in 1922 by archaeologist Howard Carter, under the patronage of Lord Carnarvon, the media frenzy that followed was unprecedented, and in many ways continues to this day. Carter and his team took 10 years to clear the tomb of its treasure because of the multitude of objects found within it. While the objects Carter’s team catalogued and stabilized were housed and secured, the tomb itself became a “must-see” attraction, open to the public and heavily visited by tourists from around the world. The tomb still houses a handful of original objects, including the mummy of Tutankhamen himself (on display in an oxygen-free case), the quartzite sarcophagus with its gran¬ite lid on the floor beside it, the gilded wooden outermost coffin, and the wall paintings of the burial chamber that depict Tut’s life and death. In addition to the wall paintings conservation, the GCI also facilitated upgrades to the protection and presentation of the site, including infrastructure (walkways, viewing platform, signage, lighting, and an air filtration and ventilation system to mitigate humidity, carbon dioxide, and dust), a bilingual maintenance manual for the installations in the tomb, training for local personnel, and recommendations for visitor numbers and management that include guidelines for filming inside the tomb. The tomb was open for most of the restoration project, and visitors were able to observe and ask questions as the conservators worked. The tomb is currently open to visitors. Featured photo courtesy of Getty Conservation Institute. See Getty Conservation Institute website.